An 11 foot specimen of the king of herrings, or Giant Oarfish, has washed up on the shores of Sweden. The Giant Oarfish, which can attain lengths of almost 40 feet and weigh as much as 600 pounds, has not been seen in Swedish waters for over 100 years. Many believe that reports of Sea Serpents may have been, at least in part, sightings of the Giant Oarfish. Believed to live at depths between 60 and 100 feet, specimens seen on the surface are generally dead or dying. 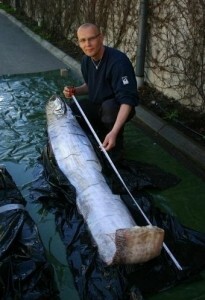 Its interesting to note that earlier this year, dozens of these rare fish washed up in Japan. This is traditionally viewed as an omen of impending disaster. Most scientists attribute the strandings to earthquakes underwater.